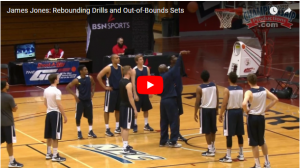 This competitive 3 team rebounding drill is presented by Yale Men’s Coach James Jones. You will need 3 color jerseys to run the drill. Each player has to score to get out of the drill. If a player commits a foul, he or she has to score twice to get out of the drill. The team that wins the drill is the first team to have all of their players score and get out of the drill. You will either need to have the same number of players on each team or have one player go twice on the teams that have fewer players. Nice drill. Is this on a Championship Video? Hi Jeff. Yes it is from a Championship Video. There is a link above the video on my page to the page on the Championship website where it gives the description of the video.